Netherlands Railways from the air part 1. The east. In German railways from the air part 6 we looked at the Cologne area and its freight infrastructure –then followed the trunk freight line north. 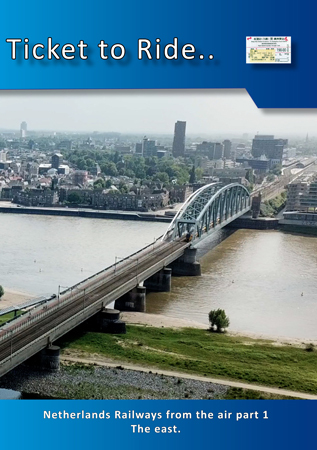 Today we look at those freight connections with the Netherlands and follow them towards their ultimate goals – the ports of Amsterdam and Rotterdam. The first route – the most northerly of the three principal connections between Germany and the Netherlands – is from Hanover / Berlin or Bremen / Hamburg. To avoid reversal at the very busy passenger hub at Utrecht the route is very circuitous, touching the outskirts of Amsterdam at Diemen before heading south to Gouda, then passing through Rotterdam CS on its way to either Kijfhoek or the New Port Line. There are other possibilities that we discuss along the way. We start at Deventer – a junction town on this and the cross-country line Zwolle to Den Bosch and visit: Apeldoorn, Amersfoort, Utrecht (to see the new station and flying junctions to the east) then double back to the Betuweroute then Nijmegen. We conclude at the spectacular new station at Arnhem, see the trolleybuses and a dead ICE being hauled home by a Dutch Bison!